I stuffed my 50mm lens—wrapped in a yellow handkerchief—into my left, 16oz boxing glove and placed the boxing glove deep in my 40L backpacker bag for safe keeping during transportation from JFK to the Dominican Republic. I thought I was so smart. 16oz of padding. Saving space in my bag. Genius, I thought. It was over a week after arriving before I went to my bag, on a total whim, to pull it out. Maybe take the lens for a spin around the block on my new camera in this foreign place. I unlaced the dark red glove and began pulling at the handkerchief wrapped lens, all the while thinking to myself I almost never use this lens. I shoot almost exclusively with my 30mm. Just as these thoughts passed through my mind, the lens rolled out of my hand and crashed right into the tiled flooring. I stared at it on the ground. Maybe it’s okay, I thought. I scooped it up. Rattling. Crunching. I took off an end cap and glass and parts exploded to the ground. And that’s how I came to shoot exclusively with a 30mm lens. Dominican Republic. July 17, 2016. This poem was in collaboration with Julie Campbell, who gave me the prompt with this photo of a gorgeous California sunset. My ambition drives me to success. My skin suddenly too hot on my muscle. My bones. For no better reason than to control the destruction. Success more painful than failure. Looks okay to me, he said. Maybe a second opinion, she thought. It’s tiny wings flapping half-wild. Eyebrows pressed into her bangs. Fingers now pressing into the space at the base of her neck. Unless she had something wise to say. Set in a face of worried wrinkles. It’s been awhile since I’ve loved what I’m creating. I’ve never loved anything more in my work and creativity than I do when I write poetry. In my photo and design, I usually hate it later. But poetry seems to get better with age. So they couldn’t make out her stripes. As long as they don’t see me too clearly. But at least they loved her. as the horizon started to turn. This poem was in collaboration with Ranna Bigdely, who gave me the prompt “I miss the sun”. 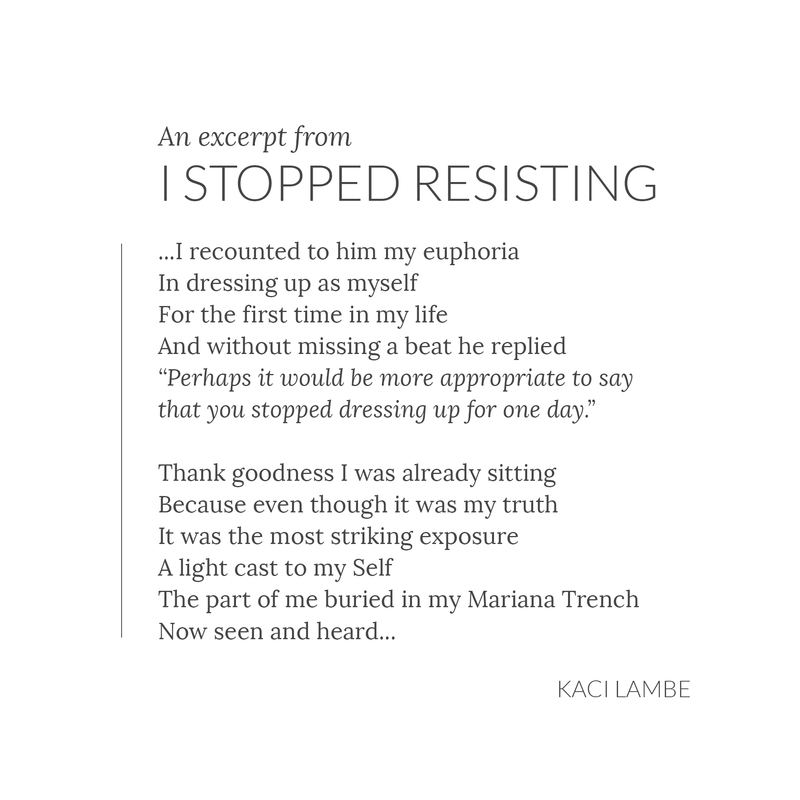 This is an excerpt from my poem I Stopped Resisting. 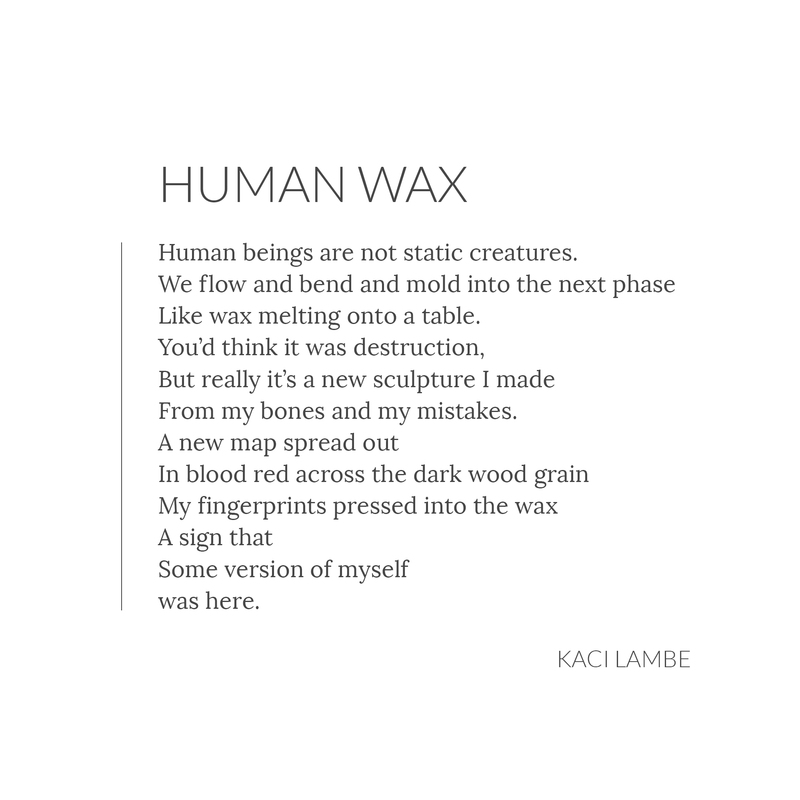 Patrons who support me on Patreon.com in any amount have access to the full poem. Become a supporter on Patreon by making a small contribution each month. In exchange, you'll get access to in-progress work, finished work earlier than anyone else, and early announcements. Plus, there are special rewards for supporting. Subscribe to my email newsletter today to receive updates on the latest news and deals!